I love nail stamping. It's such a quick and easy way to make your nails look fantastic - plus as the stamp layer is really thin it doesn't take long to dry! I can't help feel like I'm cheating a bit - but if I'm not in the mood for a long nail-painting session then they're great. These aren't the tidiest examples, especially the first one. As you can see, I cropped this picture as my index finger was a mess! It's an awesome pattern though. 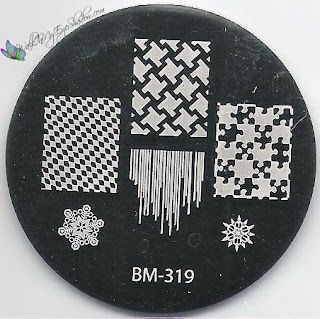 It's from stamping plate BM-319 - see it here. This next one is from plate number BM-323 - see here. This one is probably my favourite plate I have so far - I love all the patterns! The photo isn't great - it was a light pattern but more visible than the camera portrays. The biggest thing I've learnt from nail stamping so far is to let the colour underneath completely dry before you stamp, as you have to push quite hard. Think I'm going to HAVE to paint my nails again now, even if they are all ugly and short! I agree! Konad ones are so expensive and they do the same thing. I got mine off trademe (NZ ebay) for $1-3 each, but Konad ones are a good $20 - rip off!